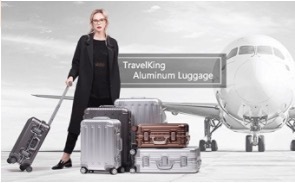 TravelKing All Aluminum HardShell Luggage is offered with three color options of gold, gray and silver and in three sizes of 20, 24 and 28 inches. 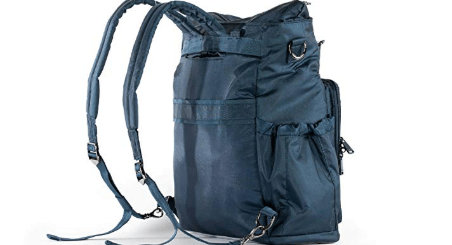 Whatever size and color you choose, they all have the hundred percent aluminum body and the nylon-lined waterproof lining with the organizer to keep your stuff organized and in place during your journey. The smallest 20-inch unit is the carry-on suitcase that weighs 9.7 pounds with the measurements of 21.6 x 14.6 x 9 inches. So it conforms to most of the airlines’ requirements for cabin luggage in the US, but best to check prior to your flight. This one measures 19 x 13.4 x 9 inches inside, so with a 35 L capacity it is spacious enough for a 20-inch carry-on luggage and you should be able to fit quite a bit. It is suitable for your short business trips, weekends away and is great the frequent traveler that flies all the time. The 55L capacity 24” suitcase weighs 12 lbs, with the exterior measurements of 26.7 x 18.3 x 9.6 inches and 23.6 x16.8 x 9.5 inches for the interior. The largest 75L interior capacity 28” suitcase weighs 13.7 pounds, measures 30.1 x 19.6 x 10.2 inches with the interior dimensions of 27.6 x18.4 x 10.3 inches. All the three suitcases have the bumper corners made of aluminum- magnesium alloy to protect the suitcase and your stuff and to help improve the durability. The interior compartments will let you put in quite a bit- depending on the size you choose but all the three have the zippered section on one side to keep your loose stuff in place and the straps on the other side for your clothes. 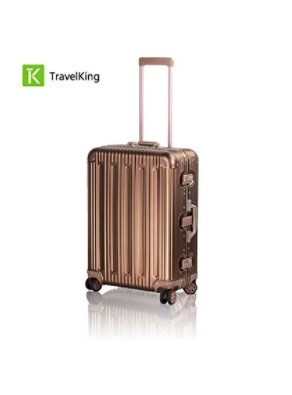 Whether you choose the silver, gold or gray, the Travel King luggage has a bright color so it will be difficult for you to not spot it easily on the carousel at the airport. You have the enhanced safety with the dual TSA approved combo lock which is easy to use with the clear instructions in the box, including the reset as the original is 0-0-0 and will be very easy to guess. There are no keys that you may lose and no zippers on the exterior of this luggage. It has the 8 chrome accented spinner wheels (4 x dual blades) that rotate in all directions- 360 degrees quietly and easily through the airports and parking lots- on rough grounds with the double rubber protectors. The three-level retractable telescopic handle with the push button will also help the luggage be moved around- maneuvered easily and effortlessly in tight spaces as it will help keep the weight off your arm, whether you are short or tall. And you will find two carrying handles on the side and the top, on all the three sizes- 20, 24 and 28 inches. You will get a travel bag for your miscellaneous items, free of charge in the package which also includes a luggage cover. With a premium design and appearance, this is a beautiful looking suitcase all over- inside and out. It is built very sturdy with great quality components and will still look as brand new after many flights over time. The waterproof lining inside is quite a nice feature. And there is a waterproof travel bag so you can use it to separate your wet or dirty clothes from your clean clothes. This is not a cheap or low-cost suitcase by any means and you may be able to get a set of three to less than the price of the smallest Travel King, but the quality and functionality will nowhere be the same. Whichever size and color you go for, you’re guaranteed a very good quality and nice looking suitcase. *Please note that TK-CG-20, TK-TG-20, and TK-SV-20 are the model numbers for the gray, gold and silver 20”, TK-CG-24, TK-TG-24 and TK-SV-24 are for the 24” and TK-CG-28, TK-TG-28 and TK-SV-28 for the largest 28-inch suitcase.